Many visitors planning a trip to the national park don’t realize that the town of Banff is a bustling commercial centre. The town’s location is magnificent. It is spread out along the Bow River, extending to the lower slopes of Sulphur Mountain to the south and Tunnel Mountain to the east. In one direction is the towering face of Mount Rundle, and in the other, framed by the buildings along Banff Avenue, is Cascade Mountain. Hotels and motels line the north end of Banff Avenue, while a profusion of shops, boutiques, cafes, and restaurants hugs the south end. Also at the south end, just over the Bow River, is the Park Administration Building. Here the road forks—to the right is the historic Cave and Basin Hot Springs, to the left the Fairmont Banff Springs and Banff Gondola. Some people are happy walking along the crowded streets or shopping in a unique setting; those more interested in some peace and quiet can easily slip into pristine wilderness just a five-minute walk from town. 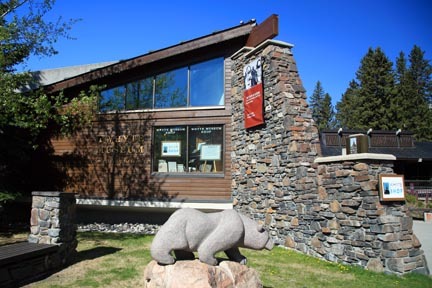 Although displays of stuffed animals are not usually associated with national parks, the downtown Banff Park Museum provides an insight into the park’s early history. Visitors during the Victorian era were eager to see the park’s animals without actually having to venture into the bush. A lack of roads and scarcity of large game resulting from hunting meant that the best places to see animals, stuffed or otherwise, were the game paddock, the zoo, and this museum, which was built in 1903. In its early years, the Banff Zoo and Aviary occupied the grounds behind the museum. The zoo kept more than 60 species of animals, including a polar bear. The museum itself was built before the park had electricity, hence the railroad pagoda design using skylights on all levels. As times changed, the museum was considered outdated; plans for its demolition were put forward in the 1950s. Fortunately, the museum was spared and later restored for the park’s 100th anniversary in 1985. While the exhibits still provide visitors with an insight into the intricate workings of various park ecosystems, they are also an interesting link to the park’s past. The museum also has a Discovery Room, where touching the displays is encouraged, and a reading room is stocked with natural history books. features changing art exhibitions. 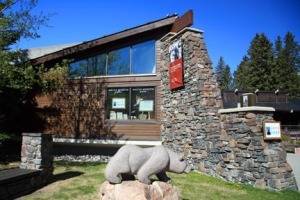 The museum also houses the library and archives of the Alpine Club of Canada. On the grounds are several heritage homes and cabins formerly occupied by local pioneers. 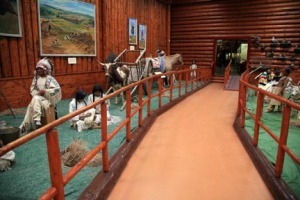 The Whyte Museum hosts interesting walking tours through summer. The most popular of these is the Heritage Homes Tour, which allows an opportunity for visitors to take a closer look at the historic residences located in the trees behind the museum, including that of Peter and Catharine Whyte. This tour departs up to five times daily through the summer. The tour is $8 per person or free with museum admission. On the Luxton Open House tour, you can visit the home of a prominent Banff family at your own leisure 1 to 3 p.m. Friday to Sunday in summer. Admission is $8, or free with museum admission. Linking the south end of Muskrat Street to Glen Avenue, the Banff Pedestrian Bridge across the Bow River was officially opened on July 2 2013. 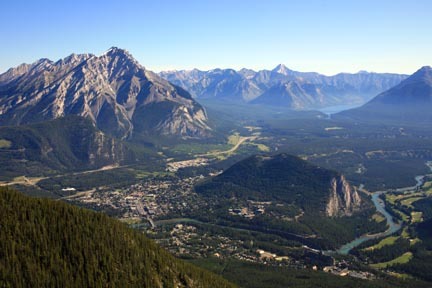 Views extend west (upstream) up the Bow Valley and east to Tunnel Mountain. 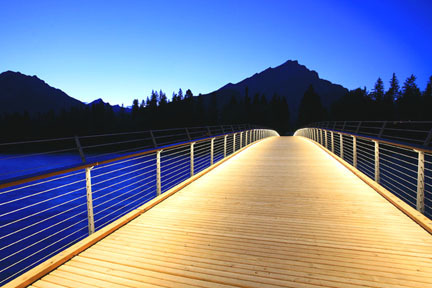 In addition to the views, the bridge has a practical purpose – linking downtown to south side attractions such as the Fairmont Banff Springs and Bow Falls (see below). For the technically inclined, its 80-meter-long central span makes it one of the world’s longest wooden bridges of its kind. 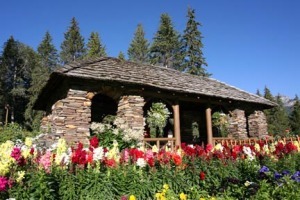 Across the river from downtown, Cascade Gardens offers a commanding view along Banff Avenue and of Cascade Mountain. The gardens are immaculately manicured, making for enjoyable strolling on a sunny day. The stone edifice in the center of the garden is the Park Administration Building, which dates to 1936. It replaced a private spa and hospital operated by one of the park’s earliest entrepreneurs, Dr. R. G. Brett. Known as Brett’s Sanatorium, the original 1886 structure was built to accommodate guests drawn to Banff by the claimed healing qualities of the hot springs’ water. Looking like a stockade, this museum (1 Birch Ave., 403/762-2388, 11 a.m. to 6 p.m. daily in summer, 1 to 5 p.m. daily the rest of the year, adult $8.50, senior $6.50, child $3) overlooks the Bow River across from Central Park. It is dedicated to the heritage of the First Nations who once inhabited the Canadian Rockies and adjacent prairies. The museum was developed by prominent local resident Norman Luxton in the early 1900s. At that time it was within the Indian Trading Post, an adjacent gift shop that still stands. 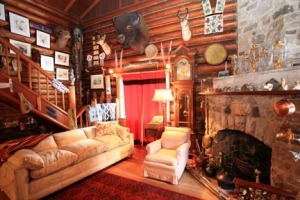 The museum contains memorabilia from Luxton’s lifelong relationship with the Stoney, including an elaborately decorated tepee, hunting equipment, arrowheads dating back 4,000 years, stuffed animals, original artwork, peace pipes, and traditional clothing. Various aspects of native culture–such as ceremonial gatherings, living in a tepee, and weaving–are also displayed. The adjacent Indian Trading Post is one of Banff’s more unique gift shops and is definitely worth a browse. At the end of Cave Avenue, this historic site (403/762-1566, 9 a.m. to 6 p.m. daily in summer, noon to 4 p.m. Wed. to Sun. the rest of the year, adult $4, senior $3.50, child $2.50) that is the birthplace of Banff National Park and of the Canadian National Parks system reopened in 2013 after extensive renovations. Here in 1883, three men employed by the CPR stumbled on the hot springs now known as the Cave and Basin and were soon lounging in the hot water–a real luxury in the Wild West. They built a fence around the springs, constructed a crude cabin, and began the long process of establishing a claim to the site. But the government beat them to it, settling their claims for a few thousand dollars and acquiring the hot springs. Bathhouses were installed in 1887, and bathers paid $0.10 for a swim. The pools were eventually lined with concrete, and additions were built onto the original structures. Ironically, the soothing minerals in the water that had attracted millions of people to bathe here eventually caused the pools’ demise. The minerals, combined with chlorine, produced sediments that ate away at the concrete structure until the pools were deemed unsuitable for swimming in 1993. 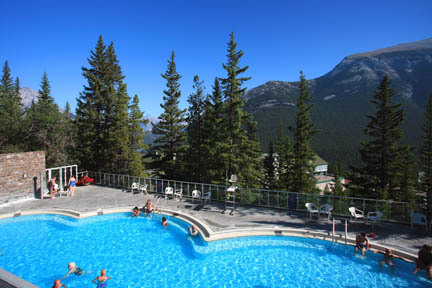 Although the pools are now closed for swimming, the center is still one of Banff’s most popular attractions. Interpretive displays describe the hows and whys of the springs. A narrow tunnel winds into the dimly lit cave, and short trails lead from the center to the cave entrance and through a unique environment created by the hot water from the springs. Interpretive tours run three times daily in summer. These springs high above the town of Banff were first developed in 1901. The present building was completed in 1935, with extensive renovations made in 1996. Water flows out of the bedrock at 47°C (116.6°F) and is cooled to 40°C (104°F) in the main pool. Once considered for privatization, the springs are still run by Parks Canada and are popular throughout the year. ; lockers and towel rental are a couple of dollars extra. Within the complex is Pleiades Massage & Spa (403/760-2500), offering a wide range of therapeutic treatments, including massages from $60 for 30 minutes as well as body wraps, aromatherapy, and hydrotherapy. The easiest way to get high above town without breaking a sweat is on this gondola. The modern four-person cars rise 700 meters (2,300 feet) in eight minutes to the summit of 2,285-meter (7,500-foot) Sulphur Mountain. From the observation deck at the upper terminal, the breathtaking view includes the town, Bow Valley, Cascade Mountain, Lake Minnewanka, and the Fairholme Range. Bighorn sheep often hang around below the upper terminal. The short Vista Trail leads along a ridge to a restored weather observatory. Between 1903 and 1931, long before the gondola was built, Norman Sanson was the meteorological observer who collected data at the station. During this period he made more than 1,000 ascents of Sulphur Mountain, all in the line of duty. 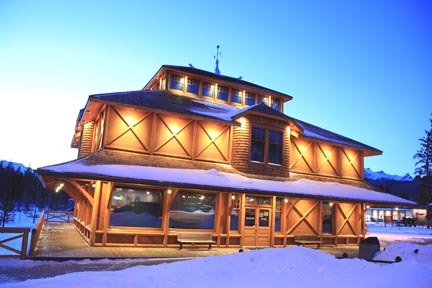 The Summit Restaurant (403/762-7486) serves up cafeteria-style food combined with priceless views. Above this eatery is the Panorama Room (403/762-7486, June to mid-Oct.), dishing up more of the same, but buffet-style, and the Chinese Regal View Restaurant (403/762-7486). From downtown, the gondola is three kilometres (1.9 miles) along Mountain Avenue. May to October, Brewster (403/762-6767) provides shuttle service to the gondola from downtown hotels. A 5.5-kilometer (3.4-mile) hiking trail to the summit begins from the Upper Hot Springs parking lot. Although it’s a long slog, you’ll be rewarded with a discounted gondola ride down ($15 one-way). On a terrace above a bend in the Bow River is one of the largest, grandest, and most opulent mountain-resort hotels in the world. What better way to spend a rainy afternoon than to explore this turreted 20th-century castle, seeking out a writing desk overlooking one of the world’s most-photographed scenes and penning a long letter to the folks back home? “The Springs” has grown with the town and is an integral part of local history. William Cornelius Van Horne, vice president of the CPR, decided that the best way of encouraging customers to travel on his newly completed rail line across the Rockies was to build a series of luxurious mountain accommodations. The largest of these was begun in 1886, as close as possible to Banff’s newly discovered hot springs. The location chosen had magnificent views and was only a short carriage ride from the train station. Money was no object, and architect Bruce Price began designing a mountain resort the likes of which the world had never seen. At some stage of construction his plans were misinterpreted, and much to Van Horne’s shock, the building was built back to front. The best guest rooms faced the forested slopes of Sulphur Mountain while the kitchen had panoramic views of the Bow Valley. On June 1, 1888, it opened, the largest hotel in the world, with 250 rooms beginning at $3.50 per night including meals. Water from the nearby hot springs was piped into the hotel’s steam baths. Rumor has it that when the pipes blocked, water from the Bow River was used, secretly supplemented by bags of sulphur-smelling chemicals. Overnight, the quiet community of Banff became a destination resort for wealthy guests from around the world, and the hotel soon became one of North America’s most popular accommodations. Every room was booked every day during the short summer seasons. In 1903, a wing was added, doubling the hotel’s capacity. The following year a tower was added to each wing. Guest numbers reached 22,000 in 1911, and construction of a new hotel, designed by Walter Painter, began that year. The original design–an 11-story tower joining two wings in a baronial style–was reminiscent of a Scottish castle mixed with a French country chateau. This concrete-and-rock-faced, green-roofed building stood as it did at its completion in 1928 until 1999, when an ambitious multiyear program of renovations commenced. At first, the most obvious change to those who have visited before is the new lobby, moved to a more accessible location, but all rooms have also been refurbished, and many of the restaurants changed or upgraded. 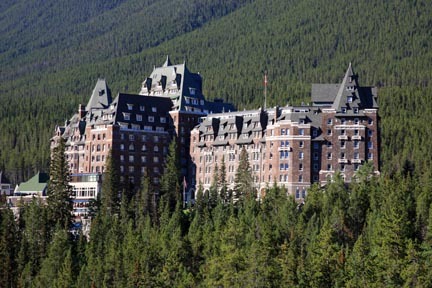 The Canadian Pacific moniker remained part of the Banff Spring’s official name until 2000, when the hotel, and all other Canadian Pacific hotels, became part of the Fairmont Hotels and Resorts chain. Don’t let the hotel’s opulence keep you from spending time here. Wander through, admiring the 5,000 pieces of furniture and antiques (most of those in public areas are reproductions), paintings, prints, tapestries, and rugs. Take in the medieval atmosphere of Mount Stephen Hall, with its lime flagstone floor, enormous windows, and large oak beams; take advantage of the luxurious spa facility; or relax in one of 12 eateries or four lounges. 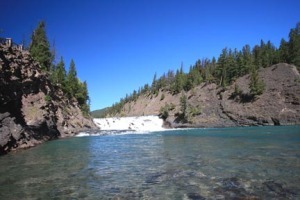 The hotel is a 15-minute walk southeast of town, either along Spray Avenue or via the trail along the south bank of the Bow River. Banff Transit buses leave Banff Avenue for the Springs twice an hour; $2. Alternatively, horse-drawn buggies take passengers from the Trail Rider Store (132 Banff Ave., 403/762-4551) to the Springs for about $90 for two passengers. Small but spectacular Bow Falls is below the Fairmont Banff Springs, only a short walk from downtown. The waterfall is the result of a dramatic change in the course of the Bow River brought about by glaciation. At one time the river flowed north of Tunnel Mountain and out of the mountains via the valley of Lake Minnewanka. As the glaciers retreated, they left terminal moraines, forming natural dams and changing the course of the river. Eventually the backed-up water found an outlet here between Tunnel Mountain and the northwest ridge of Mount Rundle. The falls are most spectacular in late spring when runoff from the winter snows fills every river and stream in the Bow Valley watershed. To get there from town, cross the bridge at the south end of Banff Avenue, scramble down the grassy embankment to the left, and follow a pleasant trail along the Bow River to a point above the falls. This easy walk is one kilometer (0.6 mile); 20 minutes each way. By car, cross the bridge and follow Golf Course signs. From the falls a paved road crosses the Spray River and passes through the golf course. This low peak on the east side of town is an excellent destination for visitors looking for a lookout over town via a short hiking trail, but nestled on its lower flanks is the Banff Centre, which is also worth visiting. 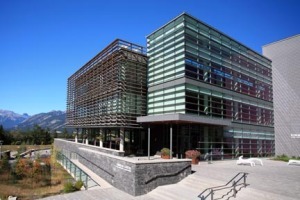 On the lower slopes of Tunnel Mountain is Banff Centre, whose surroundings provide inspiration as one of Canada’s leading centers for postgraduate students in a variety of disciplines, including Mountain Culture, Arts, and Leadership Development. The Banff Centre opened in the summer of 1933 as a theater school. Since then it has grown to become a prestigious institution attracting artists of many disciplines from throughout Canada. The Centre’s Walter Phillips Gallery (St. Julien Rd., 403/762-6281, 12:30 to 5 p.m. Wed. to Sun., free) presents changing exhibits of visual arts from throughout the world. 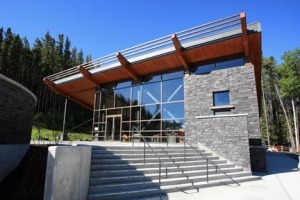 Activities are held on the grounds of the Banff Centre year-round. Highlights include a summer educational program, concerts, displays, live performances, the Playbill Series, the Banff Arts Festival, and Banff Mountain Festivals, to name a few. Call 403/762-6100 for a program, go to the website www.banffcentre.ca, or check the Bow Valley Crag and Canyon (published weekly on Wednesday).